Designed by legendary Swiss movement manufacturer Lemania in 1978, the calibre 5100 enjoyed a great reputation amongst military watch manufacturers. However, the course of events in of the following two decade following its birth would lead the Swatch Group to decide to phase out this remarkable calibre on its 23rd birthday. Ten years later, two competing German watchmakers who seem smart enough to share suppliers are about to release a worthy successor of the 5100, which is ironically based on the very calibre that spelled its doom: the Valjoux 7750. I guess the demise of the Lemania 5100 can be attributed to a somehow related string of various reasons: Lemania’s lack of focus on low-cost movements prior to the Quartz Crisis made them ill-prepared to facing competition and undergoing restructuration. No matter how good their movements from the 1970’s might have been, those didn’t match with the Valjoux 7750 in terms of modularity and profitability, which spelled their doom. By the end of the 1950’s Swiss competitors Lemania and Valjoux had both proven that they were capable of manufacturing high-end chronograph blanks. Joined in the SSIH (Société Suisse pour l’Industrie Horlogère) with Omega and Tissot since 1932, the Lemania Watch Company designed the calibre CH27, which was used on the first versions of the legendary Omega Speedmaster. 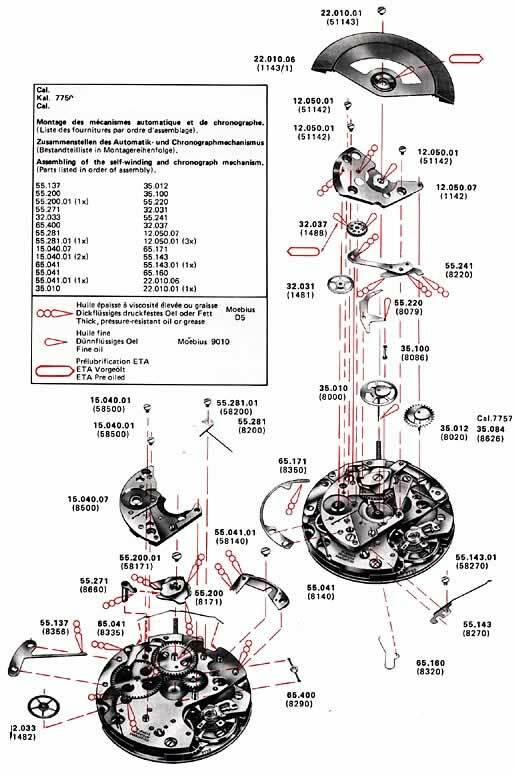 Inside the ASUAG (Allgemeine Gesellschaft der schweizerischen Uhrenindustrie AG) since 1931, Valjoux designed the calibre 72 which was used on the first Rolex Oyster Cosmographs. Both calibres were traditional constructions that relied upon a column-wheel to command chronograph operations. The year 1968 saw a Worldwide race amongst movement manufacturers to design and build the first mass-produced integrated automatic chronograph. Citizen, Seiko and Zenith were on the drawing boards, and Zenith is credited with the world first in 1969 with the release of their integrated automatic chronograph calibre 3019. At the time, Lemania and Valjoux were busy with cheap hand-wound chronographs. Lemania had already released the calibre 1872 in 1966, but Valjoux could profit from the rich portfolio of Venus: in 1969, they released the the low-cost calibre 7733, which was building upon the already simple architecture of the Venus 188. The newly acquired expertise of Valjoux in low-cost manufacturing allowed them to design the automatic integrated calibre 7750, which was less sophisticate than the high-beat Zenith 3019, and much cheaper to build thanks to the choice of a cam and plastic components. Lemania arrived late to the scene of integrated automatic chronographs with their calibre 1340 (released in 1972), which featured a very clever central minute counter. Infortunately, a quick look at the construction suggests that the Lemania 1340 might have been more expensive to build than the Valjoux 7750. Lemania eventually remedied 8 long years later with the release of the calibre 5100 in 1978, which used several parts in plastic and featured the clever central minute counter of the earlier 1340. In 1978, Hong Kong had then become the world’s largest exporter of electronic watches. Following tradition, the Valjoux 7750 was mostly available to watchmakers as blanks. In other words, watchmakers would buy the raw, unfinished movement parts, and they would then mount rubies, polish surfaces, chamfer the edges and apply electro-plating based on their own requirements. As a matter of fact, in 1993 the International Watch Company released the Destriero Scafusia, a high-end watch that was based on the low-cost Valjoux 7750 architecture, not without undergoing radical modifications. I don’t have yet hard date to support this claim, but my guess is that the Valjoux 7750 offered to watchmakers much more flexibility and modularity than the competing products. Back in Swirzerland, the first ripples of the Quartz Crisis were slowly making a lot of factories and calibres redundant. By 1983 the situation was so bad that the authorities encouraged the merger of Lemania’s group SSIH with the owner of Valjoux, ASUAG, to create the SMH (Société de Microélectronique et d’Horlogerie), which eventually became the Swatch Group in 1998 under the control of late Nicolas Hayek. The SSIH brought to the table Lemania’s calibre porfolio, and the ASUAG brought the Valjoux portfolio. The Valjoux 7750 was 8 years older than the 5100, which is actually a very good thing in that industry: it means that production of the 7750 had received much more tweaks and adjustments, and was thus more streamlined than that of the 5100. As a consequence, the Valjoux 7750 must have been produced in bigger quantities than the Lemania 5100 at the time, and must have thus been cheaper for third parties to purchase. To add oil to the fire, the Lemania factories went through a hiatus until 1991, when their know-how was finally integated into the Groupe Horloger Breguet to support Swatch Group’s recent acquisition of the prestigious brand Breguet. 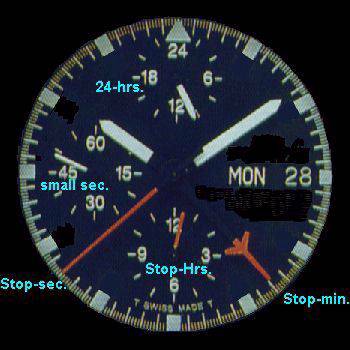 When facing the decision to reinvest in the tooling and manufacturing of Lemania 1340 and 5100 blanks, the Swatch Group probably came to the conclusion that diffusion of these chronographs had been too confidential, and that they were not profitable enough in comparison with the Valjoux 7750. To the dismay of military watch manufacturers Tutima and Sinn, production of the 5100 was brought to and end despite its technical qualities. The calibre 1340 was a bit more fortunate: production is still active, namingly for use on Breguet’s entry-price chronographs. Sadly though, the central minute counter has been replaced by a 30 minutes subdial. Watchmakers Jorg Schauer and Ebel are also known for having used the Lemania 1340, although Ebel also used iterations of the Zenith 3019 at some point but now seems to lean towards use of the Valjoux 7750. On a side note, the Swatch Group seems to have reconsidered its decision to shut down production of the Lemania 5100, at least partially: in 2009, the conglomerate unveiled the calibre C01.211, which is based on the construction of the 5100. Unfortunately, the central minute counter has been removed, and the calibre is reserved to internal use by Swatch Group brands. It is thus not available to third parties. Both Damasko and Sinn have been making mention of a similar calibre, and the rumor is it has been in the works for the last 5 year. I’m not sure about the nature of their competitiveness, but its seems that the two brands are clever enough to share intellectual property like the Diapal escapement, which was patented by Damasko. Project 99 — The Race to Develop the World’s First Automatic Chronograph, by Jeffrey M. Stein. I want to say that I enjoy your blog immensely, is full of comments, projects and ideas that are very clever for the watch fan that wants to build/modify its own watches. This place is great, like the one by my late friend Chuck Maddox (RIP). The only thing that I would like to comment is about a blog article regarding the Lemania 5100 movement: This movement was not designed in 1978, but in 1970-72. I have two Omega Speedmasters one is a 176.012 and the other is a 176.016. The 176.012 was bought in 1976 new, while the other one was bought used as a parts back-up in 1991 or 1992. The year 1978 was when Orfina made its famous Porsche Design Pilot’s watch that was shown/used in the movie Top Gun of 1984. Both the 1340 and 5100 were designed approximately at the same time, but never as late as 1978 as your article indicates. The Omega Museum curator Mr. Gruchon can witness my statement, same as with Omega documents. Thanks for your time and your site, God bless you.